An ASC-US diagnosis is suggestive of a squamous intraepithelial lesion but is qualitatively or quantitatively insufficient for a definitive diagnosis of SIL. Nuclei are approximately 2½-3 times the size of a normal intermediate cell nucleus. There is minimal nuclear hyperchromasia, and slight irregularity in the chromatin distribution. Due to the increase in nuclear size, the nuclear-cytoplasmic ratio will slightly increase. Sometimes, ASC-US changes are related to bacterial, fungal or viral infection. It can also be a result of air drying (drying artifact). 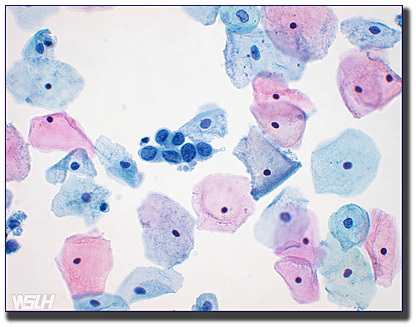 ASC-H primarily affects the squamous metaplastic cells. 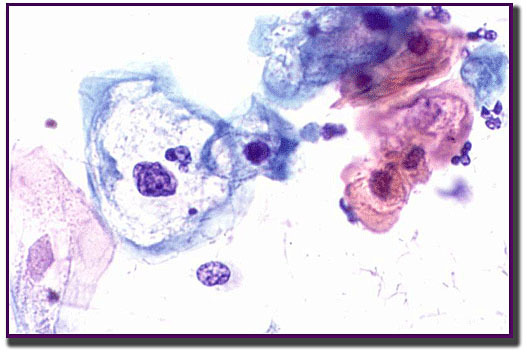 The cells display abnormal changes, but they cannot be definitively diagnosed as a high-grade squamous lesion. Patients with ASC-H are at higher risk of developing a precancerous lesion. The ASC-H cells typically are sparse and appear singly. On rare occasions the cells are seen in a group of not more than 10 cells. 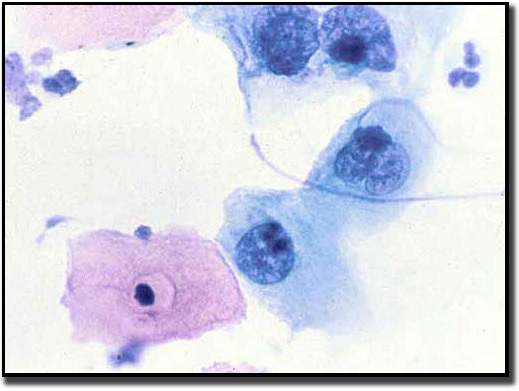 Nuclei are approximately 1½-2½ times the size of a normal squamous metaplastic cell’s nucleus. Due to the increase in nuclear size, the nuclear-cytoplasmic ratio is similar to that of a true high-grade lesion. Unfortunately, there is no usual symptom preluding to this diagnosis. 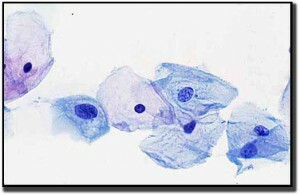 Regular Pap test screening following ASCCP guidelines are the best way to discover this lesion. 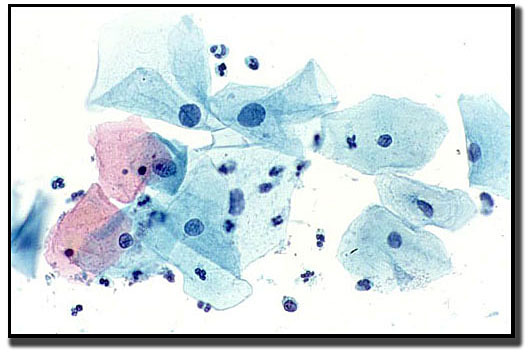 Low-grade Squamous Intraepithelial Lesion (LSIL) refers to early changes made in the size, shape, and number of cells on the surface of the cervix. Some of these lesions return to normal without treatment. 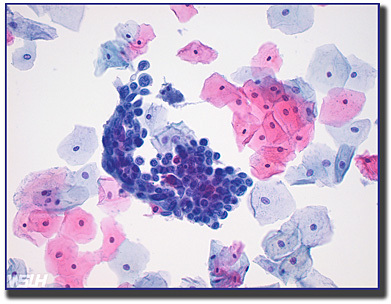 Several abnormal changes must be seen microscopically in the squamous cells in order to render an LSIL diagnosis. 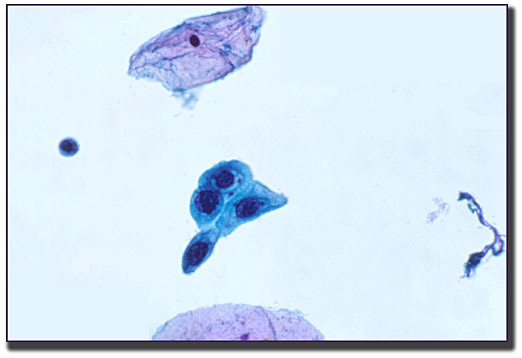 The polygonally shaped cells occur singly or in sheets. 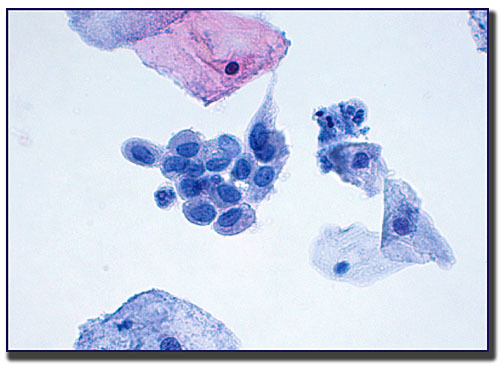 The abundant cytoplasm stains either basophilic or eosinophilic depending on the maturity of the cell. On occasion, there is a distinct cleared area surrounding the nucleus (HPV’s hallmark feature). The nucleus is heavily relied upon to aid in this diagnosis. Sometimes the cell is binucleated or multinucleated. The most striking feature is the abnormally large, dark nucleus. Unfortunately, there are typically no signs and symptoms for this diagnosis. Cervical health is best when going to annual visits along with regular screening Pap tests following ASCCP guidelines. The cells found in high-grade lesions look significantly different from a normal cell. These cells are less likely to return to normal without treatment. Without treatment and follow-up care, these types of cells have an increased likelihood of progressing to cancer. Unlike LSIL, the cells affected here are less “mature.” The cells are seen in a wide range of different sizes and can appear in sheets, singly, or in clusters. The irregular nuclei seen in this diagnostic category can vary tremendously in size with significant changes to the nuclear cytoplasmic ratio. The nuclei are hyperchromatic, but clumped chromatin can be found. If any of these symptoms appear, a gynecologist should be called immediately.